OMGOODNESS!!! 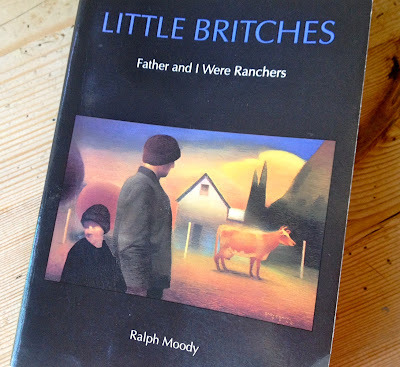 Just finished reading Little Britches by Ralph Moody aloud with Mary! (we got 1/2 way through last summer & just finished it, 270 pgs.) It is fantastic to read with your children about home, family, integrity, hard work, maturing esp. BOYS! I have fond memories of our whole family of 6 piled on our bed with my husband reading it on our bed, but Mary was too small to remember (sometimes we just left out a word or two the rough cowboys said). I drove Mary crazy these last couple weeks stopping to underline—but couldn't resist! "There are only two kinds of men in this world: Honest men & dishonest men. There are black men & white men & yellow men & red men, but nothing counts except whether they're honest men or dishonest men. I just began a couple of new Pinterest Pages that you might want to follow. One is called, "Fantastic Children's Christian Books," and you can follow it here. The other is called "Excellent Books for Adults (& Older Children!) and you can follow it here. You better believe I'm going to give you the top 3 or so things I underlined that Ralph's father told him...watch for my blog on it soon! School starts on Monday here, so I have to be sure we have food in the house and the clothes are clean or I would do it right now. Not to mention the ants are back and taking over the kitchen. If anyone knows a good remedy to rid of them, please let me know! They find food I didn't even know we had! One this morning was carrying a crumb from last night's dinner that was triple his size!! I hated to interrupt his work! No wonder God said in Proverbs to go to the ant and see how he works! That is actually a great tie-in for Little Britches. It shows the blessing of hard work—so run don't walk—get in to Little Britches with your children and the Xbox will be pale in comparison.